TRAYON CAMPER AVAILABLE IN EUROPe. GUARANTEED QUALITY SLIDE-ON CAMPERS -TRAYON IS AN AUSTRALIAN MADE TRAY-BACK / SLIDE-ON CAMPER WHICH CAN BE MOUNTED ON THE BACK OF A FLAT-BED TRAY-BACK PICK-UP VEHICLE OR ON A SUITABLE TRAILER. The Trayon Camper range have been exploring all parts of Australia and the world since 1994. These campers will go anywhere your 4×4 can go thanks to its legendary and proven toughness aided by its light-weight design as well as its low profile and centre of gravity. Taking only 3 minutes to erect for camp, it is a quick and easy (1 person) operation for the user to start enjoying the outdoors. Each camper has the ability to free-stand either in camp or for storage to free up your vehicle for normal everyday use. The campers are independent and non-reliant on the vehicle to give you the freedom of choice to camp either on the vehicle or off on its own leg. It comes in single-cab, extra-cab and dual-cab versions to suit almost any suitable vehicle. Inside it has loads of space for people as well as gear, yet it will take one person less than 3 minutes to set up! 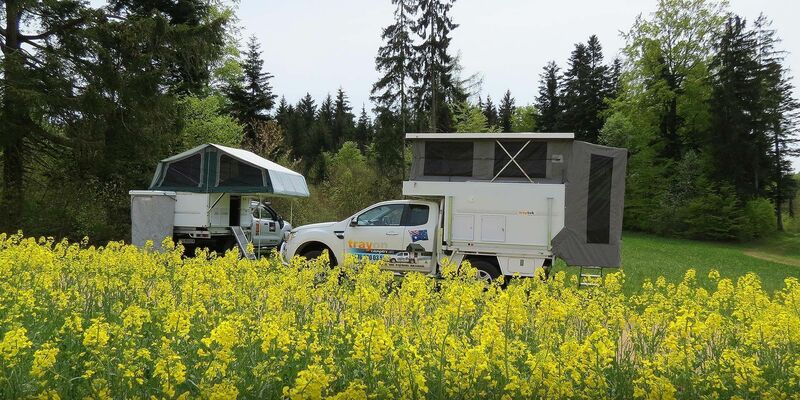 Aussie travellers love the light-weight, water and dustproof camper with all the comforts of home for its compact layout and its ease of use but the fact that you don’t have to tow anything is what really makes the Trayon Camper range so popular among campers and explorers. You can go further, use less fuel and sneak into tighter spots compared to what you would have towing a camper trailer. The Trayon Camper is made primarily from non-welded Aluminium (not Fibreglass like most other campers) allowing for a lightweight and super-strong flexible structure that comes with a 10 year structural warranty.